Roberts McCarron Skin Clinic has raised the bar for microneedling in Barnsley by introducing Dermapen, the state of the art in microneedling. As we get older the collagen in our skin depletes at an alarming rate. Microneedling promotes the natural re-growth of fresh, healthy collagen. The microneedling process involves piercing the skin with tiny needles to trigger the natural wound-repair response. The needles should go through the epidermis and reach the dermis below causing it to react to perceived damage. New collagen and elastin are produced within the dermis thickening, rejuvenating and smoothing the skin. Microneedling is especially good for reducing the appearance of stretch marks and most types of scarring. Firstly, and probably most importantly, the needles are delivered vertically rather than rolled. This means that the needle enters and exits the skin in the same direction making a far smaller hole in the dermis than rollers do. With rollers the needle enters the skin at one angle and comes out at another making a larger hole in the dermis. Secondly the Dermapen is infinitely more controllable allowing the practitioner to adjust the frequency and depth of needle delivery perfectly for each area of the skin. With rollers the frequency and depth of piercing are set and cannot be adjusted to suit the various areas of the face. Lastly the Dermapen can be used much more precisely in difficult-to-reach areas of the face such as the nose and under the eyes. 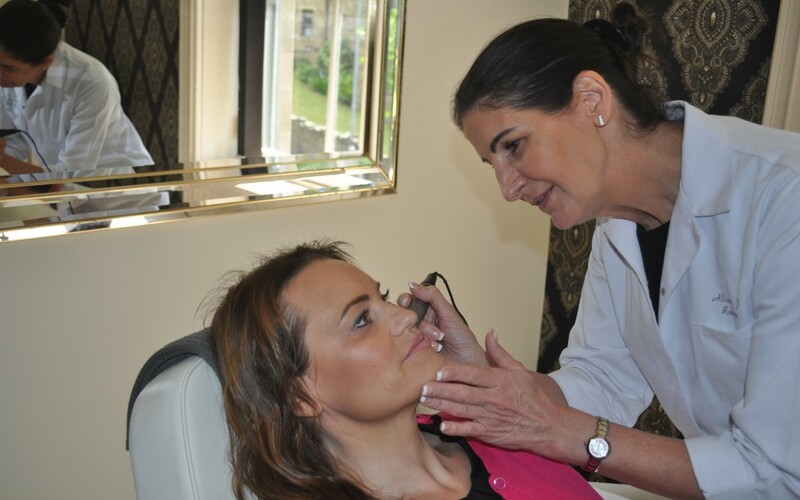 Roberts McCarron Skin Clinic is, at present, the only place in Barnsley offering Dermapen skin treatments. Is Dermapen right for you? Knowing how big a part collagen plays in the look of our skin we think Dermapen Microneedling is a fantastic way to hold back time and keep skin looking young. It’s also very effective in reducing the appearance of stretch marks and scarring. The best way to get all your questions answered and decide whether Dermapen is right for you is to come in for a free, no-obligation skin care consultation with our Clinical Aesthetician, Allison Roberts. Allison will ask you what your concerns are, answer your questions and advise honestly on your best course of action. Allison will not prescribe any treatments she doesn’t think will benefit you and you’re perfectly free to go away and think about it. Hi do you do scar treatment on other body areas with the dermapen or is it just cosmetic facial areas? Microneedling is suitable for almost any area of the body. If you have any questions or you’d like to book a consultation please don’t hesitate.